The traditional method of waste disposal employed by pig producers in Malaysia is washing wastes down with plenty of water. While this method cleans the pig pens and cools down the animals, it generates a lot of wastewaters which pollute the waterways and causes social problems. 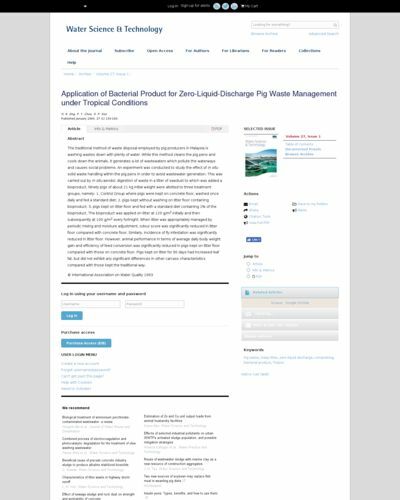 An experiment was conducted to study the effect of in situ solid waste handling within the pig pens in order to avoid wastewater generation. This was carried out by in situ aerobic digestion of waste in a litter of sawdust to which was added a bioproduct. Ninety pigs of about 21 kg initial weight were allotted to three treatment groups, namely: 1, Control Group where pigs were kept on concrete floor, washed once daily and fed a standard diet; 2, pigs kept without washing on litter floor containing bioproduct; 3, pigs kept on litter floor and fed with a standard diet containing 1% of the bioproduct. The bioproduct was applied on litter at 120 g/m2 initially and then subsequently at 100 g/m2 every fortnight. When litter was appropriately managed by periodic mixing and moisture adjustment, odour score was significantly reduced in litter floor compared with concrete floor. Similarly, incidence of fly infestation was significantly reduced in litter floor. However, animal performance in terms of average daily body weight gain and efficiency of feed conversion was significantly reduced in pigs kept on litter floor compared with those on concrete floor. Pigs kept on litter for 90 days had increased leaf fat, but did not exhibit any significant differences in other carcass characterisitics compared with those kept the traditional way.